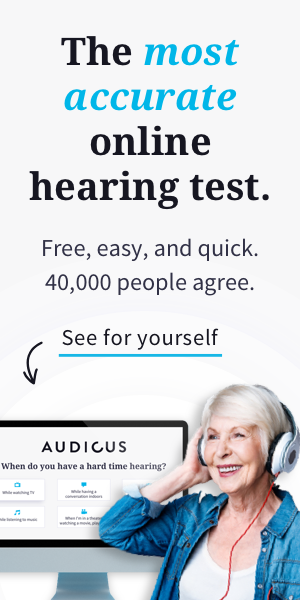 Audicus now offers 1 brand new hearing aid model, the Audicus Clara. This award-winning receiver-in-canal (RIC) is all about high-performance. Advanced sound processing, speech-focus features, and settings that adapt to your life, all mean renewed hearing everywhere. From busy restaurants to family movie night. The beautiful and discrete design means you’ll love to wear them. The Audicus Clara is the best product we’ve ever offered and starts at $699 per ear. Cut out the clutter: Microphone filters out the background noise so you can hear what matters. Control at your fingertips: Easy-to-use button. Adjust the volume throughout your day. Get in on the conversation: Digital signal processing focuses on speech and tailors the output to your unique hearing loss. Barely-there wire: Comfortable, discrete wire with size options to fit any ear. Extra power hidden in your ear: Invisible receiver sits comfortably in your ear canal providing clear speech without distortion, tuned to how you hear. Clean and clear: Earwax guards protect your device from wax to ensure sound quality and performance. Replace every 2 weeks to ensure maximum clarity. Sealed sound and comfort: Rubber domes seal out excess sound and come in multiple sizes to ensure comfort and clarity. Batteries that last as long as you do: Compact batteries power your devices for days. Easy to replace or recharge. The Audicus Clara is designed to be customized. Our programming technicians tailor each device to your unique hearing and you get to choose the in-demand features. Charging dock: Upgrade how you power your device with the charging dock. Place hearing aids in the dock overnight for a full day of power. For those who want to set it and forget it. Bluetooth remote: Connect your hearing aids to anything with a Bluetooth output. From TVs to smartphones. Like the standard remote, also enables volume control and custom settings to fit your lifestyle. For tech-savvy users who want a connected sound experience. Enhanced clarity: Upgrade your device to 12-channels for the sharpest sound quality. For those who want the HD TV experience of hearing solutions. Protect and care for your Audicus Clara with 2 new subscriptions. We’ve introduced 2 subscriptions to make caring for and protecting your hearing aids easier. Audicus Protect subscription: 24 months of complete coverage. Includes expert Clean and Care services every 6months, 1-time loss replacement, and 1-time damage repair. Audicus Care subscription: All the supplies, batteries, and tolls you need to maintain your hearing aid, shipped to your doorstep. Learn more about the Audicus Clara and explore the new Audicus website.